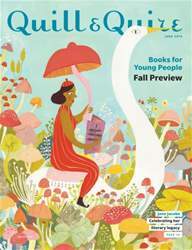 IN THE short time since graduating from the Rhode Island School of Design in 2014, this issue’s cover artist, Esmé Shapiro, has garnered lots of attention for her illustration work. 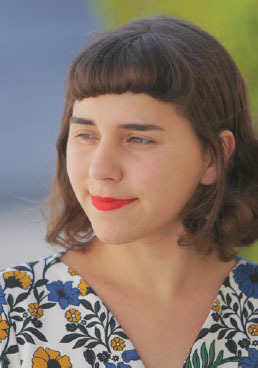 Now based in Brooklyn, New York, Shapiro – who grew up in Laurel Canyon, California, but spent summers rumbling around her grandfather’s farm in rural Ontario – works as a commercial artist, illustrator, and custom muralist. 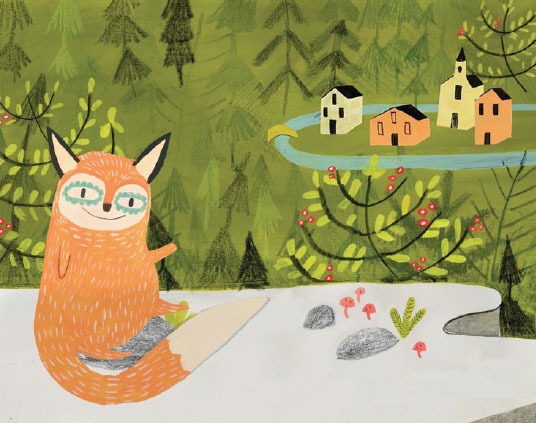 Her debut picture book, Ooko, will be released by Tundra Books in July. How did the varied landscapes of your childhood inform your aesthetic as an artist? There is a quality to the natural landscape in Ontario that seems untouched, wild, and ever flowing. I often find myself painting foliage that mimics those qualities. My hometown of Laurel Canyon was more of a dense pocket of nature bookmarked by the bustling and disjointed city of Los Angeles. The hills there are studded with flowering cacti, dried yellow grass, and 1920s craftsman houses with tiled mushroom roofs. During the early part of the 20th century, Laurel Canyon is where Hollywood elite had their hunting lodges. I found myself enamoured with the history of the land, and how those stories interconnect with what is going on in the neighborhood today. This sense of wonder sparked my interest in multiple worlds existing at once, and I try to explore that sense of whimsy in my illustrations. You’re a fairly recent design school grad. To what do you attribute your early success? As I enter into the professional realm, I feel lucky to work with my agent, Charlotte Sheedy, who really understands my vision. She has been a tremendous force in getting my work out there in the world. But I must admit that it probably helps that I am incredibly stubborn, and once I have an idea for a painting or a project in my head, I work endless hours to see it through. This often means that I work at my desk until I am basically just a bowl of soup in a dress.